Cleans and preserves smooth leather. Buffs to a rich, satin finish. Just spray on and wipe off this ready to use mixture and see the results. 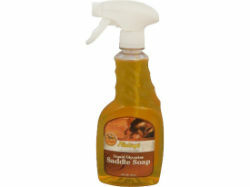 Great for use on all smooth leather articles including saddles, tack, shoes, boots, jackets, and leather upholstery .